So yesterday I told you I was working on a little canning project and I would let you know how to make it IF it turned out good…haha…well your in luck! It made it thru the pre-check process! 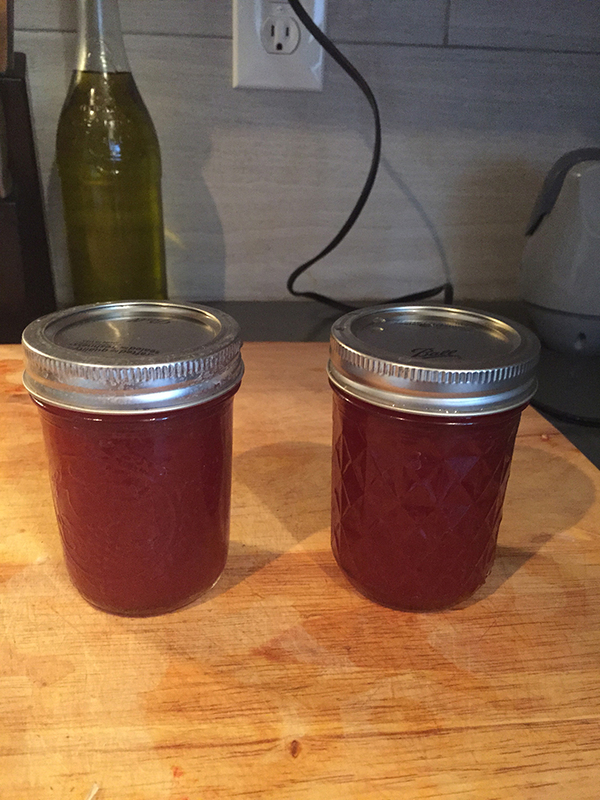 So here it goes, Homemade Ketchup…? Catsup….? either way it was yummy! Pre-warning, it does take some time, but not stiring a big pot over a stove time, but like watch it and make sure it does not burn time. Pick/buy roma tomatoes and wash, core, and X the bottom. 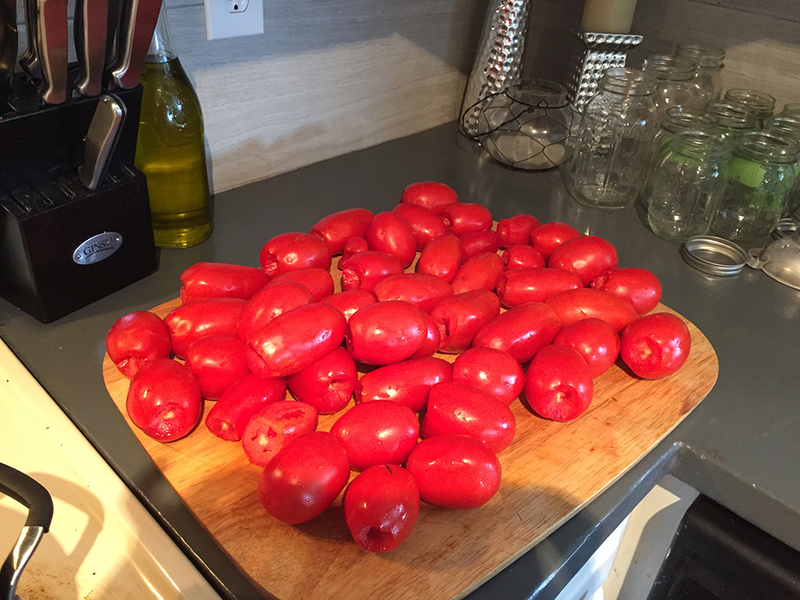 I was working with 50 good sized romas. 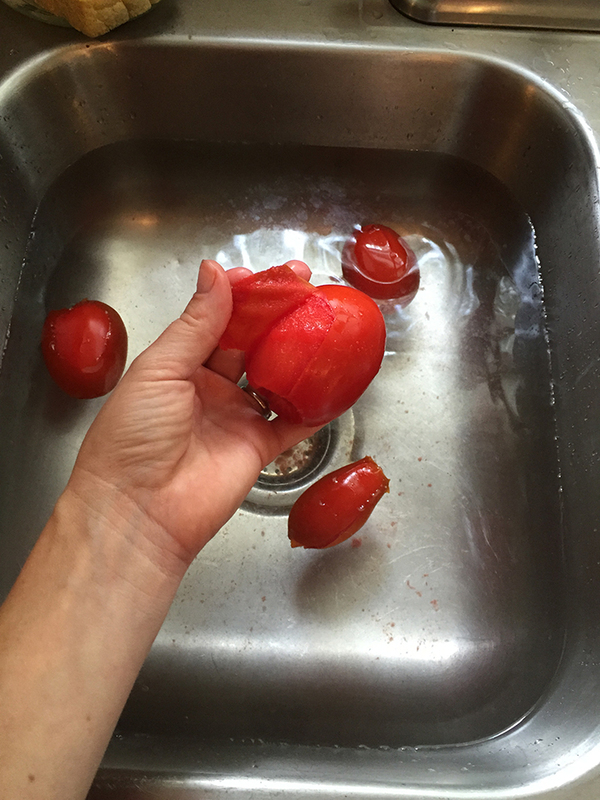 Once you have done this you want to get the skins off the tomatoes, a lot easier than it sounds. Just have a larger pot of boiling water and a sink of ice water and blanch (30 seconds in boiling water then straight into the ice water) the tomatoes. The skin will peel right off! In the large pot (at least 6 qts., preferably bigger) place your peeled, seeded, quartered tomatoes, 1 diced white onion, 1 diced red bell pepper, 1 tsp. celery salt, and 1/2 tsp. Cayenne pepper (optional, adds a little kick to the ketchup). Take a wooden spoon or a potato masher and slightly mash the tomatoes to produce enough juice to cover the bottom of your pot and bring to a boil over medium/medium high heat. Once it boils, cover and turn it down to low for 30-45 min until the tomatoes start to get soft. 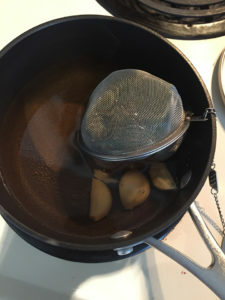 While this is going on take a smaller sauce pan and fill it with 1 1/2 cups apple cider vinegar, 2 large garlic cloves peeled and smashed (not cut, just smash them with a knife to flatten them a little). Then in a cheese cloth or one of those tea mesh balls add 1 broken up cinnamon stick, 2 tsp. whole cloves, and 1 1/2 tsp. allspice berries. Place the spices in the vinegar and bring to a boil. Once it boils turn the heat off and let the flavors meeeeellllllddddd together into yumminess…… feel free to open your windows and let the neighbors smell the goodness that will occur in your home in the next 30 min. 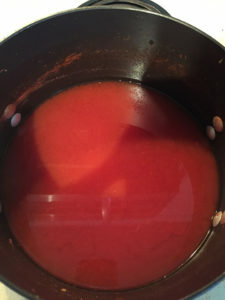 Once your tomatoes have cooked about 30 min and are getting softer, take your vinegar goodness and remove the garlic clove and spices and pour the vinegar into the tomatoes and stir, cover and cook for 30 more minutes. Take your tomatoes and in batches run them thru a food mill to remove the pulp and onions. If you don’t have a food mill you can just put them in a food processer then thru a fine colander. 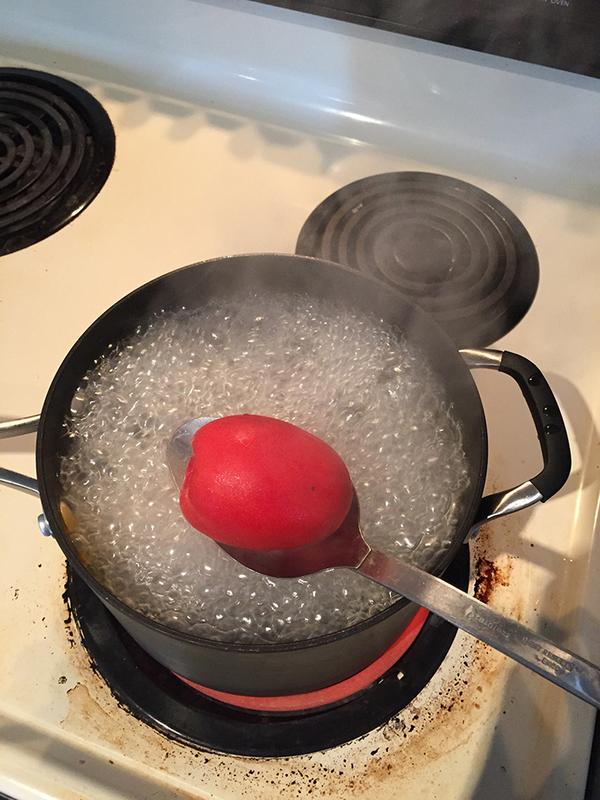 Return your pulp to the stove and bring to a boil, then reduce the heat to boil gently… here is the waiting part…. it needs to reduce by half…. it took me about an hour but I watched it pretty close to make sure it did not burn or stick to the bottom of the pot. Your looking for a tomato sauce consistence. Now you have some options, you can either place your reduced tomatoes in the fridge over night or keep treaking thru the ketchup process.. I choose to put it in the fridge for the night to set up a little bit…. your ketchup, your call…. Take your tomatoes and run them thru a blender or immersion blender to puree even more. Place back in your pot on the stove and add 1 1/2 cups sugar and 2 Tbsp. salt, stir and bring to a boil. Boil and stir until you get the consistence your looking for in your ketchup… it will take about 1 hour to get there. If your wanting to can this, prep your cans and lids(sterilize in the dishwasher) and warm your flat lids in a bowl of warm water….. for the 50 romas I only got 2 1/2 pints…..not a lot I know, but it was so worth it to me to have fresh preservative, chemical free ketchup for my little family to enjoy it was well worth the work! Process with a water bath for 15 min and make sure your lids seal shut! If your not looking into canning the ketchup, just wash a closed container to place in your fridge. Once you have your ketchup in the appropriate jar, let it cool down and enjoy your labor or yummy yummy love!!!! 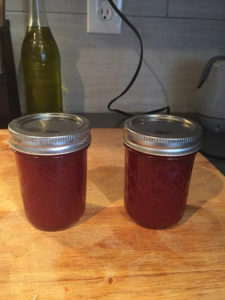 I really hope you give this a try, even if your not into making your own condiments, its fun to say, “hey want to try my homemade ketchup?” Your friends will be impressed, trust me! Let me know if you do try this or if you have a favorite ketchup or tomato recipe that is just the bees knees to you!